I’ve Been Waiting to Watch This for Ages! Not too long ago I had the opportunity to see both A Silent Voice and I Want to Eat your Pancreas (referring to this as Pancreas moving forward) at the theater. While I loved A Silent Voice, something I’ll spend more time on in a separate article (hopefully), Pancreas was more of a mixed bag. There was a lot of online hype surrounding this film, especially with the unusual title that drew me to the film in the first place, and the book this is based on is pretty well liked. So I was pretty hopeful going in, but I figured it’d be worth the experience regardless of the quality in terms of shear uniqueness. I loved telling people I was going to see this film! For those who somehow missed out on what this film is, it should be fairly obvious after one glance at the art. This is your typical sort-of-kinda romance story about a girl with a terminal illness, in this case cancer. For some that’s already going to be enough to have emotional resonance, but personally these kinds of stories need more than just some base appeal to do well long-term. Additionally, it is worth noting that in some cultures telling somebody you want to eat their diseased body parts is a way of indicating how you wish you could cure them/take the illness onto yourself. The movie flips this a bit by having the female lead, Sakura, hear about how in some cultures the diseased person eats a healthy persons body part in order to cure their own. It’s kind of the thing this film relies on to get its big moment across, but ultimately it was pretty unimportant to the actual plot. I want to take a moment to circle back to the theater here and mention something that actively hurt the movie. Before it began Aniplex decided the film should be front-loaded with interviews from both the Japanese and English casts. Awesome, right? Eh, not really. The Japanese portion was excellent as it was more a, “thanks for watching” with some genuine emotion from the cast. You could tell they loved this film! The English portion on the other hand…. It was filled with spoilers. They should not have put this at the start of the film. The one thing that this did improve was, “Gum Boy” who I would have literally given no mind to otherwise, but that’s it. So rather than discover the film for myself, I was actively told what to look out for and that signaled a lot of the plot to me way too early. Apparently this is a trend with Aniplex titles as reports of the same thing happened with NGNL 0 as well. Putting that aside, let’s talk about the actual narrative. It’s very similar to an anime, Your Lie in April except it is very upfront about the whole death thing (by the way, this is not a spoiler for either Pancreas or Your Lie in April). The series has emotional appeal and time on its side, so that’s what I’d ultimately recommend watching over this but giving the film credit, I would say this has a better narrative in so that it doesn’t beat around the bush and takes a slightly more interesting route for its ending. To level some more criticism at this Pancreas, it was a bit annoying that Sakura would shove her dying in the male leads face in order to force him to do stuff. At times she borders on abusive and that even tips him to a breaking point at one point in the film. It was a tense scene but I couldn’t help but feel it was kind of unnecessary, it didn’t feel organic at all. Then you have Sakura’s friend, Kyouko, who hates the main lead for literally no reason. You’d think Kyouko would respect her friend Sakura, who constantly tells her not to worry about the guy and that they are friends. It’s not like I couldn’t find her believable, but Kyouko just came off as an awful person. Pancreas wants you to like her though but doesn’t really do anything to get you to that point. They try and give her some redemption at the end, which was appreciated, but it felt forced. Speaking of lead boy, his name is this big secret for the film. Thematically, the idea is that you shouldn’t make assumptions about people based on appearance, their name, etc… but it resulted in a sort of anti-climax. Both my friend and I weren’t very impressed with this big reveal. Now I did speak to the ending, which I won’t spoil, but I want to note that it was by far the most interesting part. They took what felt like an obvious cliche ending and gave it a bit of a twist. There’s foreshadowing for it and it did improve the film. However, it doesn’t make up for the rest of the film. Pancreas is kind of dull and fails at tell even a pretty basic story convincingly. Again, was Pancreas worth watching? Yeah, I did enjoy it despite some pretty deep flaws, but I wouldn’t watch it again. For some this film is absolutely something to avoid, and hopefully I’ve given enough hints at things for you to decide if that’s the case for you, but otherwise this is a fairly average experience. Did you see Pancreas while it was in theaters? Let me hear your thoughts in the comments below. If you’d like to support my writing, please use my donation button below to send a few bucks my way. I’d appreciate it! Of course, thank you for stopping by and I hope you enjoy the rest of your day. That’s something a lot of folks believe. Some even think dreams can influence or predict the physical world. This is the case for high schooler Kokone Morikowa who finds herself having recurring dreams about an old bedtime story her dad used to tell her as a child called, Ancien and the Magic Tablet. When her father is taken away and a group of men are after his tablet, as well as Kokone herself, she soon realizes that her dreams may just be the key to everything. Napping Princess really wishes it were a Ghibli film and there are times where it almost feels like one. Kokone is very much the kind of female protagonist that you would expect in a Ghibli film and the world is fairly fantastical, despite being rooted in the mundane. However, a Ghibli movie this is not. On a conceptual level this is a really interesting world. You switch between the real world that Kokone occupies and the dream world of Ancien and the Magic Tablet whenever she falls asleep. This girl is crazy narcoleptic given how often that is, but really it hardly matters. When it comes to the dream world, it quickly becomes apparent that it is largely a mirror for events that occurred in the past when Kokone’s mother passed away and a vehicle to continue to propel that story forward. If I had to describe this film in a word it would be that Napping Princess is straightforward. Despite the premise involving dreams and allowed to get out there, it never really goes very far with it. Which alone isn’t a big deal but the film still has moments where it can be confusing due to the way it chooses to tell its story. It is I, the EVIL bad guy who acts very EVIL! There are several times in the film where cuts are unclear. Segments that linger just a bit too long, which ends up adding weird emphasis on unimportant details. Whole scenes that are definitely needed, but they go on so long that they undercut tension (looking at you stair climbing scene). Plus the weird inclusion of cartoon-y stock sound effects, at one point the villain becomes engulfed in flame and a toilet flush effect is used as his body crumples to the ground… why? Napping Princess is held back by these flaws and a few questions the film doesn’t really bother explaining all that well. This is a film that is meant to be appreciated by children with some fare for adults, but I can’t help feel that the lack of clear explanation on things like the death of Kokone’s mother received unnecessary ambiguity in order to keep the film light for kids. Which would be fine but they show the death of the mom in the dream world, it just doesn’t exactly explain what actually happened. There is some stuff you can infer but that just ends up opening a whole can of worms. There are some higher concept ideas hidden away in Napping Princess, like magic represent technological progress. These are really cool, and worth mentioning, but some of these ideas would warrant their own articles so I wanted to at least mention them even though I won’t be exploring them today. At the end of the day, this is a film that could have been great. The fictional world of Ancien and the Magic Tablet is fantastical and fun, really the best part of the film, but juggling that with the real world didn’t always work. With the interesting directorial choices on top of that, and you are left with a film that will certainly entertain, but probably won’t be your next favorite anytime soon. Too bad though, because this should have been a superb film, but at least it got closer to achieving that Ghibli magic than Mary and the Witch’s Flower ever did. Have you seen Napping Princess? Do you believe that dreams can influence reality? Let me hear your thoughts in the comments below. If you would like to support my work please hit the donation button below. As always, thanks for reading! A Proper Sequel or Flashback Fodder? Our First Ever Guest Post! I was thinking pretty hard about the review slots last week and asked folks on Twitter what they may like to see when I was asked if I’d like to have a guest post. We’ve never had one of those before so I figure today was an excellent time for one! Today The Fullmetal Narcissist will be sharing his review of the Ghibli film Grave of the Fireflies. More than that really. This is the kind of film that speaks to me pretty deeply, and I enjoyed it quite a lot. I’m not really going to review the film or talk about how great the story was, how the characters were likable, or any of that. Instead, I’m going to keep it short and simple. Your Name is an experience, an experience that people should have. Even if you don’t like anime, give this one a shot. What you’ll find is a compelling and human story that runs the emotional gambit. It can be silly at times. Sad at times. Happy at times. Funny… the list goes on. The point is, the film lives up to all they hype and attention it got and it would be a waste not to give it a moment of your time. 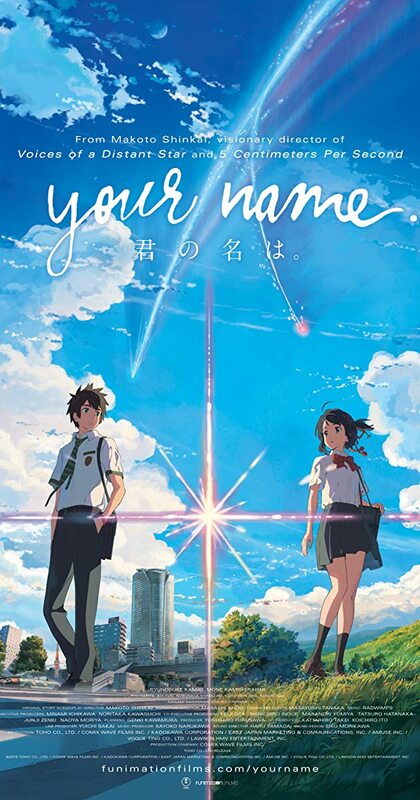 So, if you have the chance, sit down and watch Your Name. Really watch it, with no distractions, and I promise it will be well worth your time.